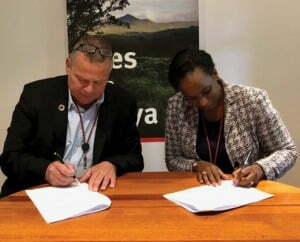 Dennis Lundo Nielsen, CEO Phoenix Design Aid and Mumbi Gichuhi, Managing Director Epsilon Publishers Limited sign a cooperative agreement at the Danish Embassy in Nairobi. We are proud to announce the signing of our partnership, on 10th July 2018, with Phoenix Design Aid. Phoenix Design Aid is a first-class design and communication agency that focuses on quality, innovation and speed. The company, which is based in Denmark, with an office in Nairobi, delivers contemporary and innovative designs by focusing on the needs of the client and delivering on them expeditiously. The basis for our partnership is that we are always looking for innovative ways to serve our clients better. This as we strive to deliver on our promise to our clients as envisaged in our core values, that: we act with integrity; we take responsibility for quality; we deliver excellence. These are shared values across both our organisations. Moreover, we are committed to operate responsibly and to advance societal goals in tandem with the UN Sustainable Development Goals. Our partnership will see us collaborate on doing different publications for our respective clients, thereby adding value to the whole process in terms of expertise and experience. The partnership will also contribute to the long-term sustainability of the two organisations by way of increasing their client base across Africa and Europe.